Yes, you can have it all in a relatively small back yard space: Fruit trees and veggies. Our “mini orchard” is on an oblong plot that’s about 25x15’, a sunny plot that came with the house we bought last summer. In that space there are 3 dwarf plums (Prunus spp. ), 2 apricots (P. armeniaca), 3 cherry trees (P. avium), 2 peach trees (P. persica), and an apple (Malus domestica), all of unknown varieties. 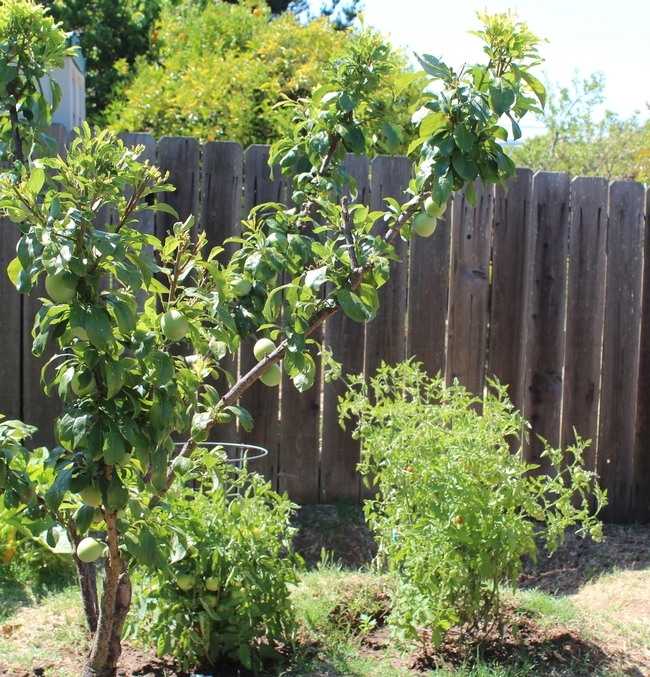 Our fruit trees are about 5 or 6 year old mostly dwarfs (I think), and if not, they got dwarfed anyway by my pruning saw and loppers last December, when I pruned both for shape and fruit production. My rule of thumb with fruit trees is that if it is higher than I can reach, it gets lopped off. This permits easy picking of the fruit and avoids the need for ladders. The pruning and thinning of the foliage, which I do about once per month (see photos) also allows more nutrients to get to the fruit, besides giving those veggies planted in between their 6-8 hours of sun. The veggies we have include 6 tomato plants (Solanum lycopersicum) in cages, 2 clumps of squashes (Curcurbita pepo), Japanese eggplant (Solanum melongena), bell peppers (Capsicum annuum), a lemon cucumber (Cucumis sativus), 3 hollyhocks (Alcea setosa), and 2 sunflowers (Helianthus annuus). 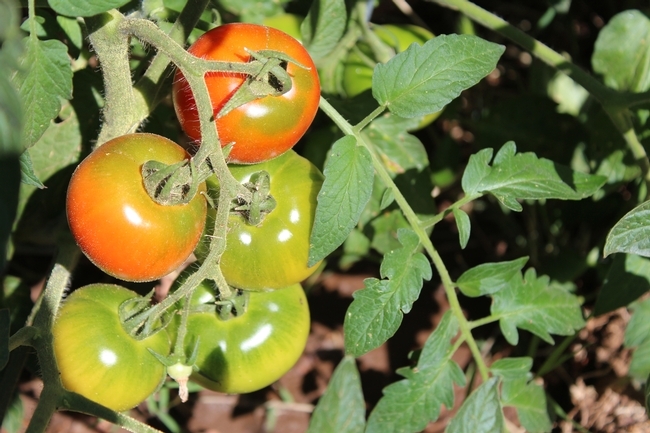 The tomatoes have been so productive we have to give the surplus to neighbors and friends. The eggplant and peppers have been slower to mature but nonetheless very tasty in stir-fries, especially with added portabella mushrooms (Agaricus bisporus) and fresh chard (Beta vulgaris), the chard grown in one of our raised beds in another location of the yard. And so, another example of when less (space) is more (more intensively gardened). 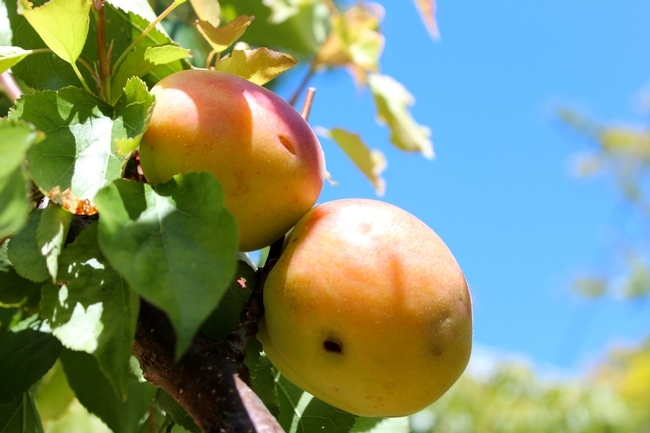 UC Davis has a publication called The California Backyard Orchard, which you may find useful for tips on pruning, both in the dormant season in during the spring and summer months. See homeorchard.ucdavis.edu. 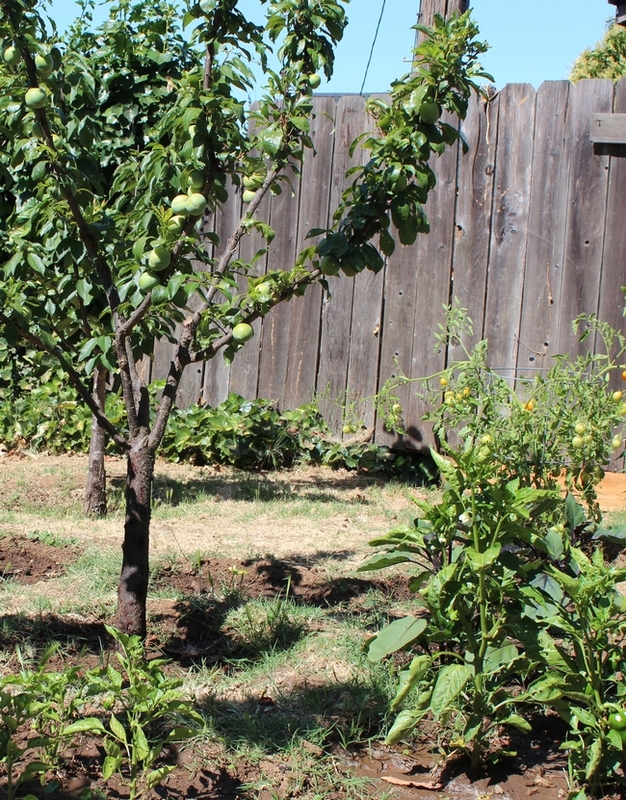 Apple tree, peppers and tomatoes.